The recent launch of mono cru Champagnes by Moët & Chandon and Nicolas Feuillatte has turned the spotlight on terroir. Curiously, this emphasis on things so small comes from two giants of an industry famed for blending its wines. It is common knowledge that Moët is the largest Champagne producer, but who realises that Nicolas Feuillatte, a.k.a. Centre Vinicole de la Champagne or CVC, is the region’s largest cooperative? Very few in the USA, that’s for sure. Most people I meet across the pond don’t even know that Nicolas Feuillatte is a cooperative. They think it is a small grower Champagne and Nicolas Feuillatte is hardly going to disabuse them of this notion. The CVC is in fact a super-cooperative: a collective comprised of no less than 85 member cooperatives and Nicolas Feuillate is its primary brand. CVC’s production facilities are so vast that they also act as an officially registered secondary production and storage facility for Moët & Chandon. Not that I suspect this cosy relationship has anything to do with both producers coming up with similar ideas being launched almost simultaneously (two days apart in the UK). There simply would be no advantage to any such connivance. Indeed, had one got an inkling of what the other was doing early enough, it may well have led to one of them abandoning its own project.Although these two ranges might be similar, there are differences that render them closer to concepts marketed by other houses than to each other. Moët’s Trilogie range, for example, consists of three non-vintage, single-vineyard, pure varietal, grand cru Champagnes, with one cuvée for each of the three classic varieties. These wines can be compared to Leclerc Briant’s Les Authentiques; three non-vintage, single-vineyard Champagnes, albeit premières crus rather than grands crus, which were launched in the early 1990s. On the other hand, Nicolas Feuillatte’s four grand cru Champagnes are from single villages, but not single-vineyards, they are vintaged, not non-vintage blends, and although pure varietal wines, there is the Meunier. These differences make the Feuillate range more similar to mono cru ranges of Barancourt, Brice and Delbeck. I tasted Moët’s Trilogie range twice (June and September) and Feuillatte’s three times (January, June and September). When it comes to Champagne, 85 points is the sort of quality I am happy to cellar for myself, while 90 points is very special indeed. A good, but not great, citrussy blanc de blancs that will pick up some complexity and a touch more finesse over the next year or two. Drink now until 2003, 85/100. This is the class wine of the trio, with its restrained richness, creamy fruit and a velvety mousse demonstrating a degree of finesse the other two wines will never achieve. The sheer length and strawberry aftertaste are the essence of Aÿ Pinot Noir. Drink now until at least 2004, 90/100. Fresh and flowery with a cushiony mousse. I was initially less impressed with this than I was with the Chouilly, but it has improved at a faster rate and is now on a par. It could, however, be better still. Meunier is intrinsically less expressive than either Chardonnay or Pinot Noir, but there are ways to extract more Meunier oomph, such late-harvesting a small proportion, say, 20% and fermenting this element in barrique. Drink now until 2003, 85/100. The complexity and structure of this cuvée was unbelievably Pinot-like in January, but its extraordinary finesse made it my clear favourite at the time. Several months down the line and all these new cuvées have developed, but this is now my second favourite, although it has the greatest potential finesse, complexity and longevity of all the Chardonnay grands crus in this range. Drink now until 2004, 87/100. Although this has improved by leaps and bounds since January, Moët’s Chouilly has the edge. When I first tasted Feuillatte’s Chouilly it had a distinctive malo-style on the palate, which led to a toffee-like finish, but by September it had become the fruitiest of all its grands crus. However, this wine remains the simplest, least potentially complex cuvée in the range. Drink now until 2004, 84/100. This was fresh and juicy in January, but promised to build up a biscuity complexity. However, the bottles tasted in June and September were both new disgorgements, so I’m still waiting for the biscuitiness, although I have no doubts that it will come. Drink between now and 2003, 86/100. The Moët wines have a suggested price of £55 each and can be found at Harvey Nichols, Harrods and Fortnum and Mason, while the Feuillatte wines will be around £29 each as and when they are stocked in the UK. Anyone interested in purchasing Feuillatte’s grands crus should contact Matthew McCulloch at Feuillatte’s UK agents, Thierry’s Wine Services, on info@thierry’s.co.uk, who will be able to provide an update on any stockists. Should you be visiting Paris, they are available at the Nicolas Feuillatte Boutique, 254 rue du Faubourg Saint-Honoré, Tel: 00 33 (1) 42.27.61.19 or Fax: 00 33 (1) 42.27.99.94. Whether Moët or Feuillatte triumphed depends on how you look at the results. Moët had the top-scoring wine, Feuillatte the lowest-scoring. All three Moët wines are good enough for my cellar, yet three of Feuillatte’s are currently superior to two of Moët’s (I have to qualify that with “currently” because all these wines are new and not even their makers know for sure how they will develop). On an average score, Moët’s range pips Feuillatte’s, but its wines are 80 per cent more expensive. However, they are not meant to compete with one another. 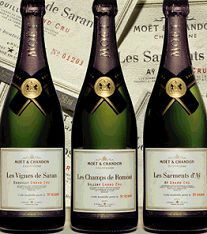 In fact, they do not even compete for each others customers, since the vast majority who would buy Moët’s upmarket Trilogie Champagnes would never consider buying from a cooperative, whereas most of those who regularly enjoy Nicolas Feuillatte would not dream of paying a premium for the name of Moët & Chandon. 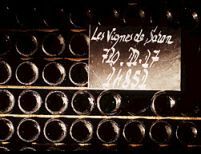 Despite Champagne’s supremacy in the global sparkling wine market, the two largest players in the game both realise they cannot afford to take this position for granted. What is even more interesting is that they both consider the most important message to get across is the vital role that is played by terroir. This is paradoxical, in the construction of a blended wine. Both ranges reflect this point, but Feuillatte’s is more constructive, Moët’s more academic. We cannot begin to get to grips with all the region’s 300-odd villages, let alone tens of thousands of lieux-dits (individually named vineyards), but we can at least come to terms with the 17 most expressive villages, the grands crus of Champagne. If we can understand what each of these villages can contribute to a blend, we will be able to grasp the potential typicity of Champagne’s three most famous districts – the Côte des Blancs, Montagne de Reims and Vallée de la Marne. Feuillatte’s range of grands crus can help us progress along this path, but Moët’s Trilogie cannot. Its cuvées pander more to Champagne collectors with the deepest pockets; those who simply must have every vintage of Krug’s Clos du Mesnil, for example.These cuvées are vital for Moët’s survival because the larger the house, the more it needs to express individuality if it is to retain its reputation as well as size. However, there is, I think, a flaw in the fundamental concept the Trilogie range and this needs tweaking if it is to be successful in the long-term. What Moët has tried to create in these wines is the very essence of terroir, but where it has gone wrong is to make these Champagnes non-vintage. When I asked Georges Blanc, Moët’s new Chef de Cave, why they even considered this, he told me that there was much internal debate over whether these cuvées should be vintaged or not. Arguments for and against raged for some time, but eventually the non-vintage lobby got its way. ‘Above everything else, the aim was to express terroir, terroir, terroir’ Georges insisted, ‘and a vintage would only detract from this’. He added that the flexibility of blending several vintages would help guarantee a consistent product each year and here is where the argument falls down because the result of this blending can never be a pure expression of terroir. The vagaries of vintage are part of terroir. The product of the greatest terroir will differ from year to year, even if its special situation enables it to be more successful than its neighbours. By mixing different years, Moët has not expressed terroir, but has blended it into a homogeneity that Georges hopes to repeat with every bottling. He provided a glimmer of hope, saying that Trilogie is a totally new project, so nothing is carved in stone. I hope the vintage lobby gets its way in future.One thing that everyone at Moët & Chandon is in total agreement about and that is the need to keep developing interesting new Champagnes if it is to attract interested new consumers. Even the largest Champagne house must attract new consumers constantly just to stand still.After all, its customers are mortal. There’s natural wastage with every generation that goes by and with each new generation so the shift has gone from Old World to New. This has had less effect on Champagne than on French wines generally, but this has not led to complacency at Moët.The one great project that few other than Moët & Chandon could hope of tackling would be to market a complete range of 17 grand cru Champagnes. Even Moet would have to rely on purchasing grapes for some of these wines, since it has vineyards in only 13 grand cru villages. To follow all 17 grand cru villages every vintage would be many Champagne enthusiast’s dream. 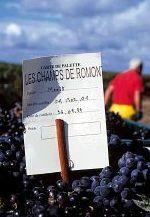 It is only possible to do this today by purchasing the Champagnes from different producers, but it needs one winemaking team to produce each and every wine for the comparison to work.Mind you, Nicolas Feuillatte is already partway there and it could easily make arrangements with other cooperatives to source all 17 grands crus.